As head FX strategist at CMC Markets–one of the world's leading forex/commodity brokers–Ashraf Laidi understands the forces shaping today's currency market and their interplay with interest rates, equities, and commodities. And now, with Currency Trading and Intermarket Analysis, he shares his extensive experiences in this field with you. Throughout the book, Laidi outlines the tools needed to understand the macroeconomic and financial nuances of this dynamic field and provides you with insights that are essential to making the most of your time within it. 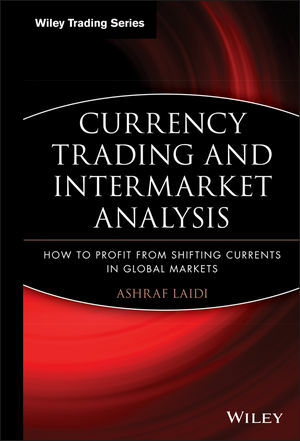 Ashraf Laidi is the head FX Strategist at CMC Markets, where he oversees the analysis and forecasting functions of G-10 currency pairs as well as decisions and trends of the major global central banks. His online FX analysis has received wide following for more than a decade, centering on G-10 currencies and economies. Prior to joining CMC, Laidi monitored the performance of a multi-FX portfolio at the United Nations, assessed sovereign and project investment risk for Hagler Bailly and the World Bank, and analyzed emerging market bonds at Reuters. He also created the first 24-hour currency Web site for traders and researchers during the inception of the Euro. He is the founder of AshrafLaidi.com. Chapter 1: Gold and the Dollar. End of Bretton Woods System Marks Gold's Takeoff. Fed Tightening and FX Interventions Rein in Gold Rally. Central Banks' Gold Sale Agreements. Recent Exceptions to the Inverse Rule. Using Gold to Identify Currency LeadersÂ and Laggards. Don't Forget Falling Gold Production. Gold and Equities: Hard versus Monetary Assets. The Role of the Speculators. Gold is Part of a Larger Story. Chapter 2: Oil Fundamentals in the Currency Market. From a Gold Standard to an Oil Standard (1970s-1980s). Oil Glut and Price Collapse (1981-1986). The Super Dollar of 1980-1984: World's Third Oil Shock. World Intervenes against Strong Dollar (1985-1987). Iraq's Invasion of Kuwait and the Gulf War (1990-1991). The Asian Crisis and OPEC's Miscalculation (1997-1998). Oil Thrives on World Growth, Dot-Com Boom (1999-2000). Iraq War Fuels Oil Rally, Dollar Flounders, China Takes Over (2002-Present). Chapter 3: When the Dollar Was King (1999-2001). Annual Performance Analysis of Individual Currencies. Chapter 4: The Dollar Bear Awakens (2002-2007). 2002: The Beginning of the Dollar Bear Market. 2003: Dollar Extends Damage, Commodity Currencies Soar. 2004: Global Recovery Boosts Currencies against US Dollar. 2005: Commodities Soar alongside Dollar, Carry Trades Emerge. 2006: Dollar Vulnerable as Fed Ends Two-Year Tightening. 2007: Record Oil Boosts Loonie, Helpless Fed Hits Greenback. Chapter 5: Risk Appetite in the Markets. Carry Trades in Foreign Exchange. Using Risk Appetite to Gauge FX Flows. Tying It All Together: 1999-2007. Chapter 6: Reading the Fed via Yield Curves, Equities and Commodities. Yield Curves and the Economy. Rationale of Inverted Yield Curve Implications. Effectiveness of Yield Curve Signals' Implications. Greenspan's â??Conundrumâ?? Proved Bernanke's Problem. Implications for Growth, Stocks, and Currencies. Tying Interest Rates to the Gold-Oil Ratio. Chapter 7: U.S. Imbalances, FX Reserve Diversification and the U.S. Dollar. U.S. Current Account Deficit: Old Problem, New Challenges. Adding the Budget Balance to the Mix. Dissecting U.S.-Bound Foreign Capital Flows. U.S. Stocks and Bonds Vie for Foreign Money. Foreign Direct Investment and M&As. How Long Foreign Capital Be Available on the Cheap? Don't Ignore U.S. Investors' Flows Abroad. Currency Reserve Diversification: OPEC and the Middle East. Further Currency Diversification Is Inevitable. Chapter 8: Commodities Supercycles and Currencies. The Current Commodity Cycle versus Previous Cycles. Developing World to Maintain Ripe Outlook for Food and Grains. Energy Efficiency Not Enough to Halt High Oil. Copper and Gold to Shine on Long-Term Fundamentals. Chapter 9: Selected Topics in Foreign Exchange. U.S. Politics and the U.S. Dollar.